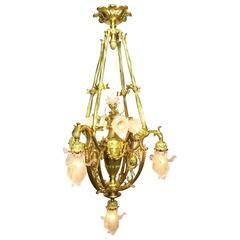 A very fine and rare French Belle Époque 19th-20th century nine-light gilt and enameled bronze "Bouquet" chandelier. The floral scrolled gilt-bronze frame formed in the shape of a floral arrangement suspended by tied tassels, surmounted with eight branches facing downward with beaded glass bulb covers, the center with blue enameled bronze oil-container sphere topped with a frosted glass shade in the shape of a burning flame. The sphere surmounted with tied branches and acanthus forming the end of a bouquet. Paris, circa 1900. Measures: Height 48 inches (121.9 cm) Width 31 inches (78.8 cm). A truly beautiful and very rare chandelier. Overall condition is excellent. Please view all images. 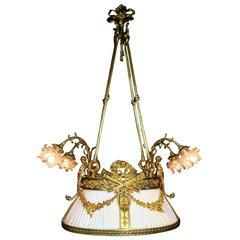 A beautiful and different chandelier made in France, circa 1900. 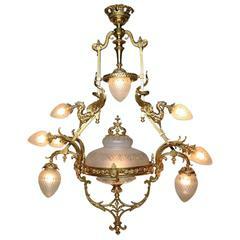 The chandelier is elegant with many smaller prisms and an unusual frame in form and shape. One of two similar antler chandelier. Beautiful and rustic 19th century French antler horn hanging lighting.